Peter Hawks presenting to coaches and athletes at Kicking Horse. Peter Hawks of the Flyin Ryan Hawks Foundation was invited to attend as an honorary guest and to speak to the athletes and coaches about the Flyin Ryan Decisions Program. Kicking Horse is a magnificent mountain in the heart of the Rockies. It is steep and the scenery is gorgeous. 150 Of the top freeride athletes aged 12-18 qualified during the season and attended this event. IFSA did a tremendous job orchestrating the competition and providing a platform for Peter to share the Flyin Ryan Decisions Program partnership with IFSA. 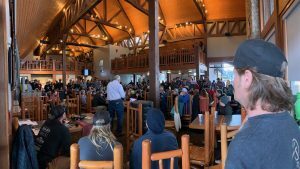 Peter spoke to the athletes about “skiing for the right reasons” and about what it takes to properly prepare for the risk management that accompanies freeride competition. He also spoke, independently, with the 70+/- coaches about the value the Flyin Ryan Decisions Program can bring to their freeride programs. He also spelled out how to install the program with their team and how to access the support materials to put it into effect. In his speech, Peter asked the athletes to employ all of their resources to be the best competitors they could be. These elements are mind, body, spirit and equipment. Peter’s remarks focused on the right reasons to ski, things that each athlete can control: Love, joy, passion, respect and gratitude. He also documented some of the pitfalls that emerge when competing, when ego drives one’s expectations and can distort and cloud over the joy that originally brought athletes to the sport. A videographer was on scene to record Peter’s remarks and to conduct interviews with athletes which will be compiled into an IFSA documentary dedicated to the partnership between IFSA and the Flyin Ryan Foundation. This documentary is underwritten by generous support from Flylow and Technica Blizzard.